It was rather late for lunch and still too early for dinner on our recent day of playing hooky. Not quite lunch, not yet dinner. Lunner? Linner? In any case, we were in the midst of some serious hooky. All four of us. Two kids. Two adults. Lots of hooky players. Remember hooky? Ditch whatever it is you are supposed to be doing and go do something fun instead? You used to have to be sneaky. Not tell anyone. No announcing it beforehand. Don't tell anyone afterwards. Well, I guess hooky is still supposed to be sneaky and secret. Even now. Even today. It is just a lot harder now to not post a picture of your whereabouts on Facebook. No secrets with fb. And once fb knows, everybody knows. So much for sneaky. Or secret. Well, it should be no secret that Legal Seafood in Washington, DC is a fantastic place to eat gluten-free! And it is conveniently located amongst several museums and Chinatown. What could be better? 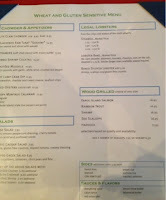 Legal Sea Foods was a most excellent choice for our lunner on our hooky day. We had had a great time, fought no crowds, stood in no lines, and had a fabulous day. On a Wednesday. In the prime of summer. We only needed to walk a couple of blocks to 7th Street for our lunner. And to top it off, we were seated immediately upon arriving at Legal. 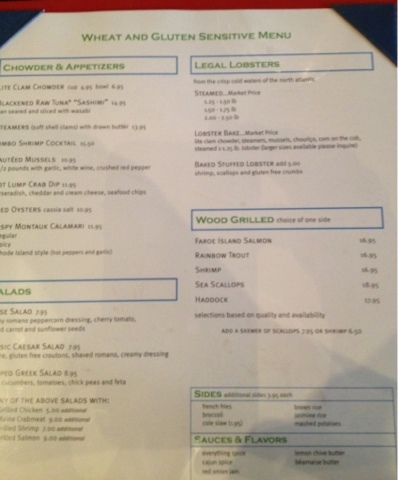 But to top that off, they have a dedicated menu for celiacs. I asked if they had a gluten-free menu and this is what they handed me. 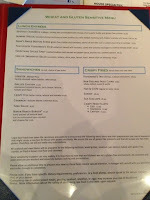 That is the first and only "celiac" menu I have ever laid eyes on. 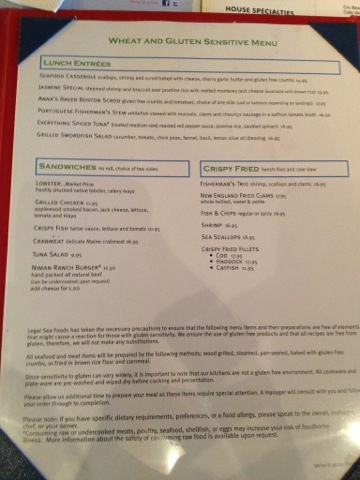 Plenty of gluten-free menus, but never a celiac menu. Thank you, Legal! And there were plenty of choices! I doubt you can read anything in those pictures there, but there were so many options for great seafood! I finally settled on the scallops. Sea scallops. None of those dinky bay scallops. They came grilled to perfection. Delicious! Fabulous! Very tasty. But you only get the privilege of a few of them. That was fine with me, but it might not be for others who expect to be stuffed walking out. No stuffing in these scallops. They were fabulous! So fresh. So delicious! And the slaw. Fresh. So very fresh. I can always tell when slaw has been refrigerated overnight. It takes on a particular taste. Particular to most readymade slaws. I do not like readymade slaw. This slaw was fresh. Fresh, as in probably made within the past two hours. There was no hint of refrigeration. Fresh, fresh, fresh. And fabulous. 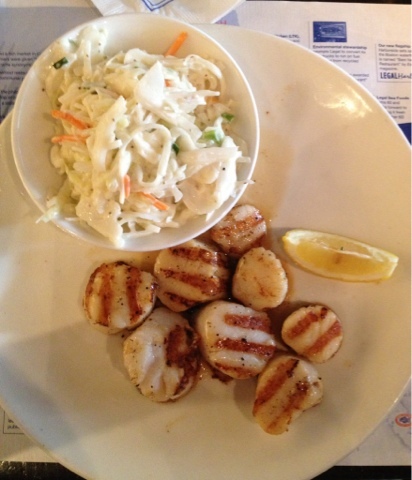 Now, go back up to that picture of my plate with scallops and slaw. See right above my plate, on the other side of those two glasses and my lime, is a bowl full of black. You can't tell what's there, but it is black. That is an enormous plate of mussels. My kids love mussels! I love mussels! And they even offered me one! Unfortunately, the mussels were not listed on the celiac menu. The chef chose to serve the mussels with a sprinkling of breadcrumbs. Completely unnecessary, if you ask me. But my son insisted that there were no breadcrumbs on that whole side of the plate and pulled out a mussel for me. Risky. I know, I know. But I do so like mussels. Just one. Only from that far side of the plate. Oh my. Butter. Garlic. White wine. Mussels. And I had thought my sea scallops were fabulous. The mussels beat them easily in tastiness! So I talked with our server and she talked with the chef. 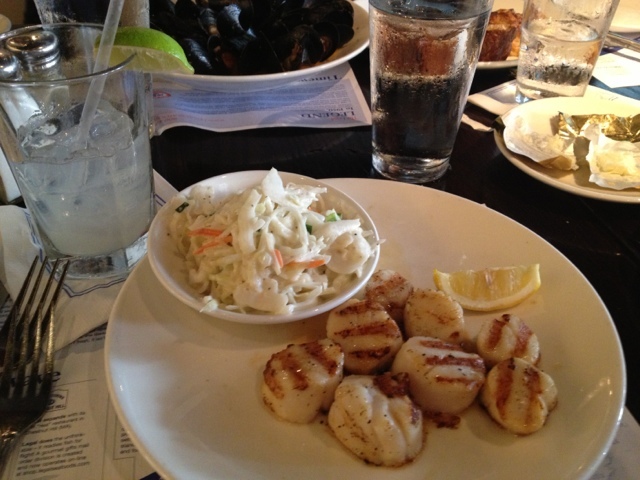 I strongly recommended that the chef leave off those nasty breadcrumbs and put the mussels on the celiac menu! 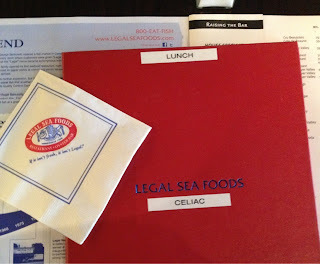 Next time I go, I won't be limited by what is on that celiac menu. I'm going to make that no-breadcrumbs request for my own mussels! I suggest you do the same. Mussels don't need to be made unavailable by added breadcrumbs! And you don't have to wait until you are playing hooky in DC. Legal has locations in several states up and down the east coast. Save all the mussels for us gluten-free folks!